Sometimes the most efficient way to kill insects is to stomp on them, literally or figuratively! Physical or mechanical control methods can be as simple as hand-picking the bagworms from a juniper bush, cutting tent caterpillars out of a shade tree, or using a fly swatter and window screens to keep your home free of flying insects. At the other end of the technology spectrum are the electronic bug killers. These high-tech fly swatters produce an ultraviolet glow that attracts flying insects to an untimely death on an electrified grid. Although bug zappers probably kill more beneficial insects than pests, their owners seem to sleep better at night with the reassuring sound of bugs sizzling on the grill. From its inception in the late 1970's, the market for these devices has grown into an industry with annual sales approaching $100 million. Simple entrapment devices work quite well to control some types of insects. Fly paper and sticky boards, for example, are often used in greenhouses to control whiteflies or leafhoppers. Fruit and shade trees can be protected from various pests (e.g., plum curculio, gypsy moth, and codling moth) by tying a band of folded burlap around the trunk with its open side facing down. As insects climb up the trunk, they are waylaid in the folds of burlap which can be treated with insecticide or inspected daily to collect the pests. Ditches or moats with steep vertical walls are occasionally used as barriers to keep crawling insects (e.g., chinch bugs or whitefringed beetles) from migrating out of one field and into another. Pitfall traps are dug at 3-5 meter intervals in the ditch and filled with kerosene or creosote to kill the pests. In the 1930's and 1940's it was common practice for a farmer to hitch a bale of chicken wire behind a team of horses (or a tractor) and drive it through his fields to stir up dust. When the dust settled, it gave the insect pests an abrasive coating that gradually rubbed away their cuticular waxes and caused them to die from dehydration. Although this is certainly not the most reliable method of pest control, it does explain why crops planted near the edge of a well-travelled dirt road often have less insect injury than those on the opposite side of the same field. Temperature extremes can be used to kill insects or prevent their injury. Cold storage of agricultural products prolongs their shelf life and retards the development of insect pests. Heat treatments are sometimes used in place of fumigation to kill insect larvae in certain types of produce. Mangoes, for example, are submersed in hot water baths (115°F for 68 minutes) to kill the eggs and larvae of fruit flies (Tephritidae) prior to export. 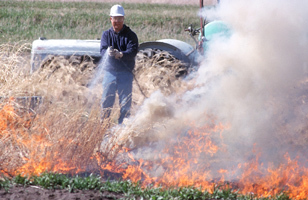 In the 1950's and 1960's enterprising farmers in the Midwest built tractor-driven flame throwers that used liquid propane (LP gas) to ignite and burn off the stubble from corn fields in the hope that a variety of soil dwelling pests would be killed by the heat. Unlike most of the other types of pest control discussed in this chapter, physical and mechanical tactics often become less practical (or less economical) when they are used on a large scale. Banding trees with burlap as protection against codling moth, for example, might be a reasonable approach for homeowners with five apple trees, but it would be far too time-consuming for commercial growers with 500 or 5000 trees.